Sussex batsman Phil Salt produced a stunning display as he led Brighton (303-6) to a four-wicket win against Eastbourne (299-8). Salt hit a 109-ball 172 not out, which included 12 sixes and 11 fours, as Brighton chased down the 300 target set by Eastbourne. Matt Machan also chipped in with 65 from 48 balls. James Hockley hit 111 for Eastbourne. Sussex’s Tom Haines hit a century as Horsham (267-7) beat Hastings (263 all out) in a thrilling run chase which went to the last ball. Joe Billings hit 143 for Hastings while Jamie Thornely to 4-65 for Horsham. Haines (110) put on 190 with his skipper Michael Thornely (92) as Horsham chased down the title. Reigning Premier Division champions East Grinstead (237-4) enjoyed a 71-run win over Cuckfield (166 all out). Leo Cammish hit 88 for EG while Ian Sturmer was pick of the bowlers with 4-31. Roffey (266-7) still lead the table with a comprehensive 189 run win over Ifield (77 all out). Jibran Khan top-scored with 58 for Roffey while Alex Collins took 3-30, Rohit Jagota 2-10, Leigh Harrison 2-12 and George Fleming 2-21 in Ifield’s reply. Daniel Phillips (76 not out) and Nathan Poole (52) led Preston Nomads (150-1) to a nine-wicket win against Middleton (149 all out). In Division Two, Three Bridges (160 all out) went top after a a 61 run win against Bognor (99 all out). Mike Rose took 4-14 for Bridges. Second-placed Mayfield (163 all out) lost to Ansty (167-6) by four wickets. Ben Williams took 5-19 as Billingshurst (78-1) cruised to a nine-wicket win against Bexhill (75 all out). Dan Joseph took 5-14 as Chichester Priory Park (131-9) beat Haywards Heath (74 all out) in a low-scoring affair. Lindfield (128-9) picked up their first win of the season as they beat St James’s Montefiore (111 all out) by 17 runs. Shohel Ahmed picked up 5-29 for Lindfield. Division 3 West: Pagham 158 all out lost to Slinfold 159-3; Roffey 2nd XI 187-6 beat Three Bridges 2nd XI 184-7; Stirlands 153 all out beat Findon 121 all out; West Chiltington & Thakeham 69 all out lost to Goring By Sea 196 all out; Worthing 151 all out lost to Steyning 229-6. Highlights: Simon Legge took 6-22 for Findon; Ben Lucking took 5-25 for West Chiltington and Thakeham. Division 3 East: Bexhill 2nd XI 140 all out lost to Hastings & St Leonards Priory 2nd XI 266-7; Burgess Hill 231-5 beat Seaford 155 all out; Crawley Eagles 86 all out lost to Preston Nomads 2nd XI 176-8; Eastbourne 2nd XI 84 all out lost to Brighton & Hove 2nd XI 85-1; East Grinstead 2nd XI 128 all out lost to Portslade 1st XI. 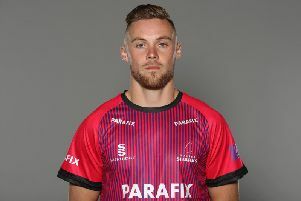 Highlights: Harry Scowen hit 104 not out for Hastings; Kevin Ramsay hit 108 for Burgess Hill; Adam O’Brien took 5-14 for Preston Nomads; Dave Mates took 4-8 for Brighton.